Cleansing and hydrating advice perfect for the season from natural beauty expert, Leigh Winters. The holiday season might be over, but winter is still here! It’s no secret that frigid temperatures outside and raging heaters inside only make for confused skin. Plus, holiday travel, work deadlines, and lack of sleep can also leave your skin feeling lackluster. If you are currently burdened with dry, oily, or congested skin, there are natural ways to heal, but you might have to take a different approach to skincare to truly glow from the inside out. 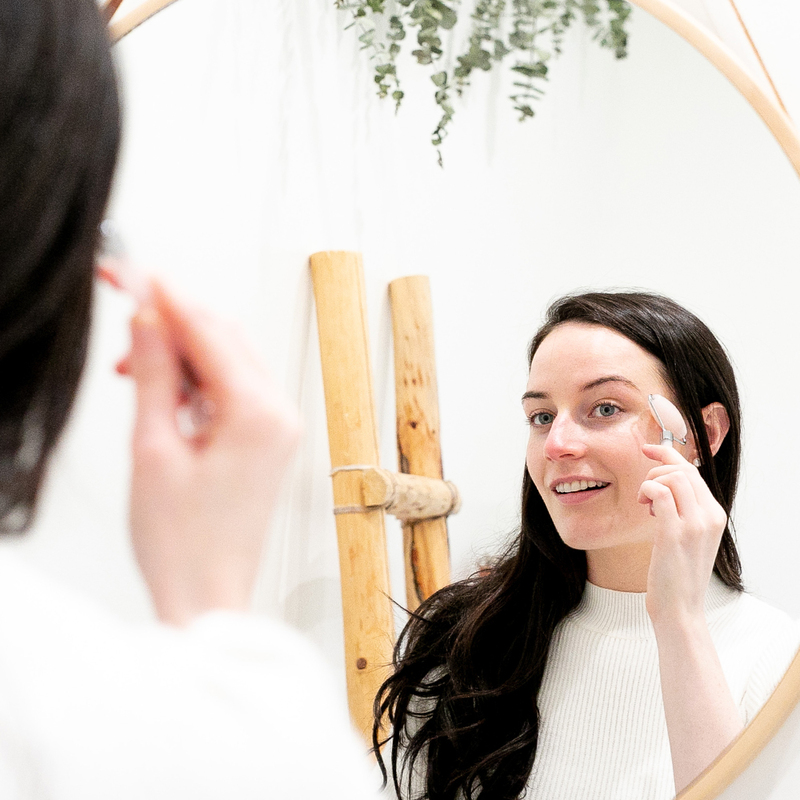 Here’s my skincare tips, including my go-to daily habits and products that will have your skin feeling its best this season, all without any harmful ingredients. I grew up thinking that I could just slough away any skin problem (bye, pimples and dryness!) with exfoliation. In fact, for many years—before I knew anything about skin health and functioning—I thought exfoliation was something to do regularly. Now, I have a totally different outlook on how to maintain my skin’s glow. Exfoliation is attractive because it almost always makes the skin appear brighter. But, you can achieve healthier skin by regularly massaging your face with a cleansing milk or cream—the key is to choose one that doesn’t foam. Foam is created using ingredients called surfactants which can be irritating and drying to the skin. Instead of harsh scrubs and bubbly cleansers, I opt for plant-based cleansers that don’t strip the skin barrier. Using a cleanser with a neutral pH, like Zen Cleanse, can help your skin beat the winter blahs. It’s also important to be mindful about a cleanser’s pH, and I always suggest using one with a pH of five, as the skin enzymes that produce beneficial ceramides (skin lipids that keep skin’s natural barrier healthy) work best at this more neutral level. 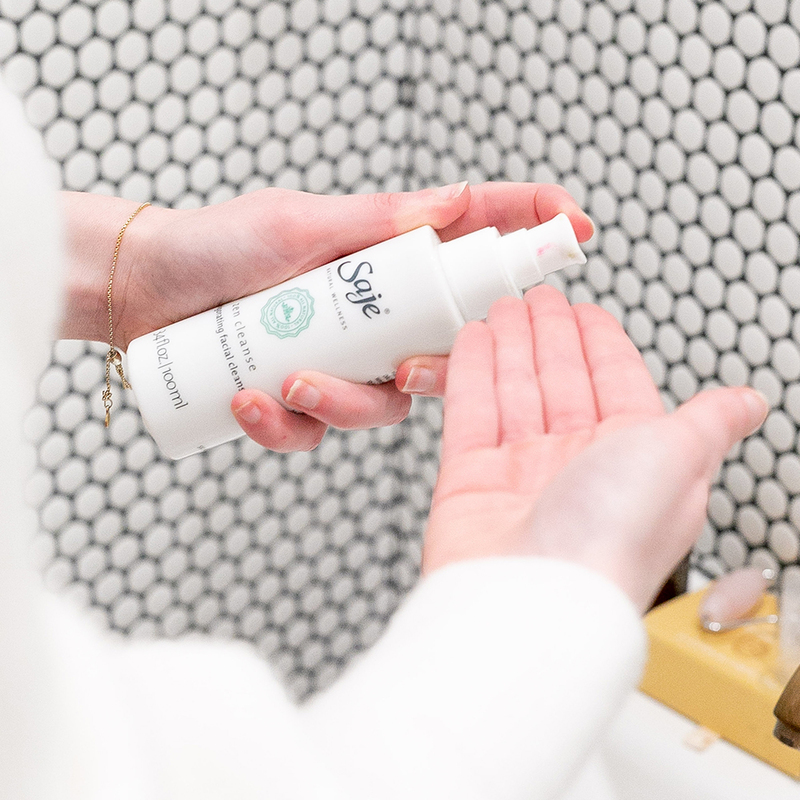 I love using Saje’s creamy Zen Cleanse because it’s mild, effective and free of harsh ingredients like surfactants and has a neutral pH of five. When cleansing, make sure to use lukewarm water, as hot water is also known to irritate the skin. After cleansing, I always apply an alcohol-free toner (like a floral water) because the slight acidity of a natural toner helps to further regulate skin’s pH levels. Right now, an intensifying debate in green beauty and skincare is how to best hydrate our skin. I believe (as does most current science!) that in order to best moisturize, a combination of water-based creams and oils will give you your most glowing skin. When it comes to layering products a good rule of thumb is to start light and work your way up to heavier coverage finishing off with your heaviest moisturizer or balm. When layering skincare products, start light and work your way up to the heavier ones. Your skin is made of multiple layers that have their own unique hydration needs. The deeper layer of your skin is hydrophilic, meaning it is attracted to water and benefits from a water-based moisturizer (like Chamomile Comfort). While oils alone might feel like they do the trick, our fragile facial skin needs H₂0 to decrease trans-epidermal water loss and stay properly hydrated. When you can, really massage your moisturizer into your skin until it’s completely absorbed. Doing so will help activate the circulation of the surface-level blood vessels and work to decongest the skin. After this step, you can reach for a heavier oil-based serum or elixir (like vitamin E-rich Sensitive Elixir), as the top layers of your skin are lipophilic, meaning they crave oils. When your skin has enough oil in the top layer, you have a healthy barrier from both moisture loss and external factors. Use a jade roller as part of your skincare routine to reduce puffiness and increase your glow factor. I frequently reach for my jade stone to practice a facial massage technique that’s becoming more and more popular: gua sha. This Traditional Chinese Medicine technique stimulates the lymph system to reduce puffiness, improve circulation, and detoxify the skin. During the long days of winter, I relish a few extra moments of my routine relaxing with my roller. 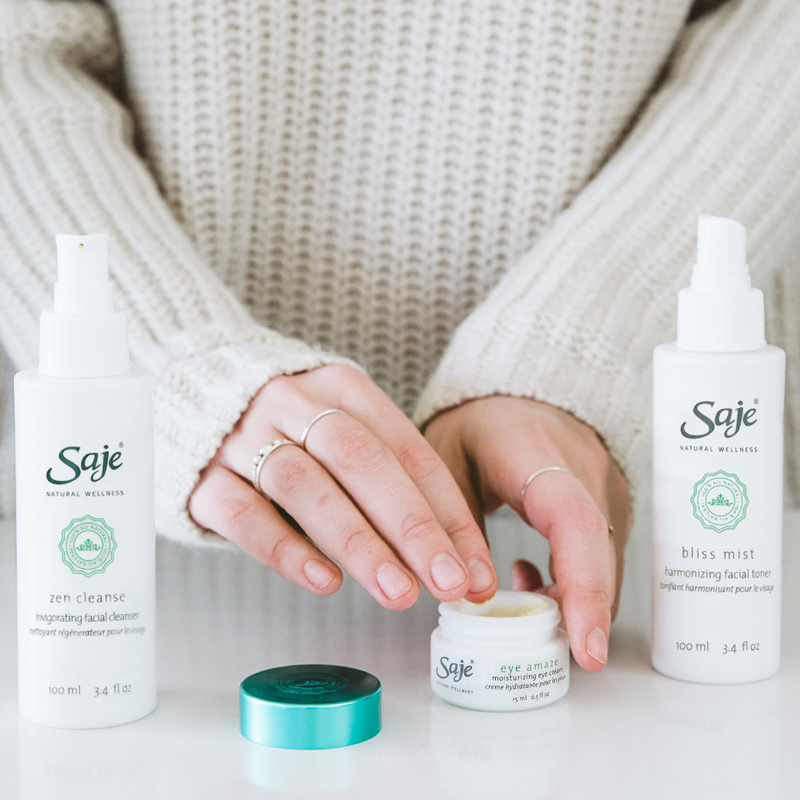 To lock in all the goodness of gua sha, I always use an antioxidant-packed serum (any Saje elixir will work!) to boost the efficacy of the treatment and any other product I’m using. Beauty sleep is real! Well-balanced skin goes beyond superficially caring for it. When we don’t get enough sleep, our skin suffers. During sleep, our skin goes into cellular repair processes that remove toxins and replenish cells. Sometimes sleep can elude us, making it hard to get your body the rest it needs. I have a reliable pre-sleep routine that calms my mind and body that eases me into sleep, including diffusing relaxing essential oils, like lavender and roman chamomile. Create your own sleep routine and your skin (and the rest of your body) will thank you all year long!